By bonding front-line agents directly with senior managers and other key personnel, Xtreme provides a stimulating basis for connection, knowledge-sharing, alignment and mentoring between employees whose functions might not ordinarily intersect. 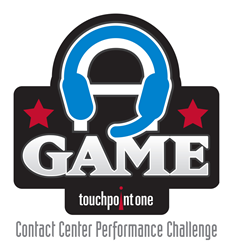 TouchPoint One, the leading provider of employee engagement and performance optimization solutions for contact centers, announced today that TMC, a global, integrated media company, has named A-GAME Xtreme as a 2017 CUSTOMER Product of the Year Award winner. A-GAME is the cloud-based gamification platform that transforms contact center operations into competitive sports and other themed leagues. A-GAME scoring is based on the same metrics that are used to measure success for the business, providing a fun and practical way to engage and inspire employees and leverage the popularity and enthusiasm associated with the collegiate, professional and fantasy sports experience. A-GAME Xtreme expands employee engagement beyond the front-lines, enabling senior managers and other employees to draft “fantasy” teams comprised of agents from across the entire contact center operation. Xtreme teams compete head-to-head in regular season matchups and for post-season division titles and league championships. By bonding front-line agents directly with senior managers and other key personnel, Xtreme provides a stimulating basis for connection, knowledge-sharing, alignment and mentoring between employees whose functions might not ordinarily intersect. A-GAME offers contact centers a fresh and dynamic mechanism to address morale, retention, skills and career development and to realize the business benefits of stronger employee engagement. The 2017 CUSTOMER Product of the Year Award recognizes vendors that are advancing the call center, CRM and teleservices industries. The award highlights products which enable their clients to meet and exceed the expectations of their customers. The 19th Annual Product of the Year Award winners will be published in the 2017 1st quarter issue of CUSTOMER magazine. To learn more about the features and benefits of A-GAME and A-GAME Xtreme, visit the TouchPoint One web site, schedule a software tour and needs assessment today. TouchPoint One is the leading provider of employee engagement and performance optimization solutions for contact centers. TouchPoint One solutions enable improved decision making, talent development, and process execution at every operational level and deliver the rich benefits of performance gamification through innovative design and complete, functional alignment with business processes and strategies. TouchPoint One, Acuity and A-GAME are registered trademarks of TouchPoint One, LLC. All other registered or unregistered trademarks are the sole property of their respective owners. © 2017 TouchPoint One, LLC. All rights reserved.